The National Sailing Hall of Fame (NSHOF) celebrated its eighth class of Inductees on Sunday, November 11, at Lauderdale Yacht Club (LYC), concluding three days of activities that included a symposium for junior sailors with Inductees, a boat tour of LYC’s hidden neighborhood off the Intracoastal Waterway and social events at both LYC and the city’s iconic Top of the Pier at Pier 66. “The common thread this year is the blending of art and science in sailing; putting the two together to achieve excellence on the racecourse,” said Gary Jobson, President of the NSHOF in his preface to introducing the Inductees. 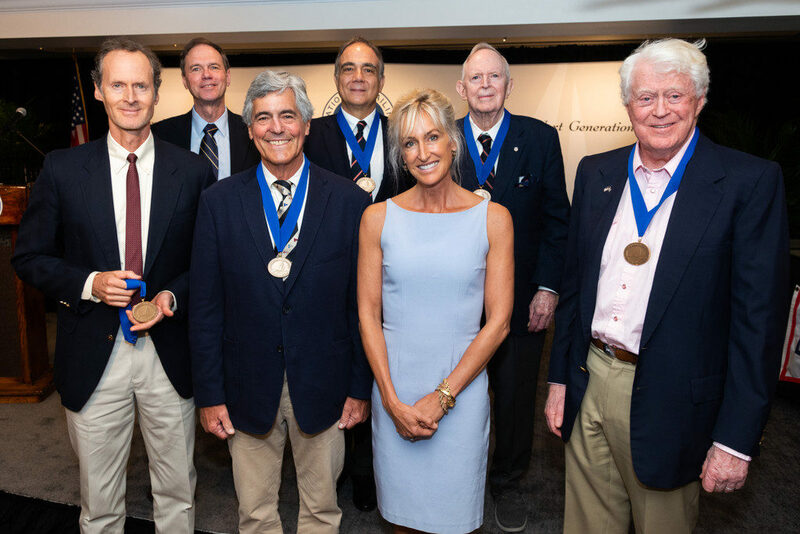 Inducted to the National Sailing Hall of Fame as members of the Class of 2018: famed yachting cinematographer John Biddle (Philadelphia, Penn./Jamestown, R.I.); three-time Soling World Champion, Brazilian-American Olympian Vince Brun (San Diego, Calif.); and shipbuilder and naval architect William Webb (New York, N.Y.); and three Inductees who were recognized with the NSHOF Lifetime Achievement Award: the late Greek-American shipping magnate and veteran offshore sailor, George Coumantaros (New York, N.Y.); businessman, noted maritime memorabilia collector and 1992 America’s Cup winner, Bill Koch (Palm Beach, Fla./Osterville, Mass. ); and 1975 Star World Champion Ding Schoonmaker (Naples, Fla./Watch Hill, R.I.), who was not only instrumental in the founding of the US Sailing Center in Miami but also was a tireless advocate for the sport through his involvement with the national governing body, as well as the International Sailing Federation, now known as World Sailing, of which he served two terms as Vice President. Posthumous Inductee John Biddle (1925-2008) was born into two prominent Main Line families (Biddle and Wharton). He started experimenting with his father’s movie camera and, after mastering ocean sailing, used his siblings and cousins as film subjects on Narragansett Bay. After stints in World War II and the Korean War, Biddle spent several years working as an engineer while photographing weddings and babies on the side. A skiing film led him to think he could do the same for sailing, and the following summer, the 1956 Newport Bermuda Race became the key part of his first film and subsequent lecture show. Using a 16mm film camera, Biddle shot from 130’ above the deck of square-rigged ships and 15’ under water. He filmed in Greenland, and from Greece to New Zealand. He filmed the Newport Bermuda Race a remarkable 11 times, the only film-maker to have focused on the iconic race. He chronicled the America’s Cup 10 times during its 12 Metre heyday. His sailing proficiency allowed him to capture the action while staying clear of the racing crew. Biddle’s 140 sailing films were shown at his annual lectures between 1956 and 1996, and his film archive of the sport is considered one of the most comprehensive and important in existence. Posthumous Inductee William H. Webb (1816-1899) inherited his father’s shipbuilding business (Webb & Allen) at the age of 23. He would go on to become the foremost shipbuilder in New York City of his day. Between 1840 and 1869 he contracted for, designed, and supervised the construction of 135 wooden vessels including fishing schooners, ferry boats, clipper ships, and steamships, along with ironclad warships for European navies. During this 29-year period, Mr. Webb constructed both a larger number and a greater tonnage of vessels than any other American shipbuilder of the era and he was active in the formation of a number of steamship lines, both before and after his retirement from shipbuilding. By the 1870s, however, the construction of ships became more complex and it became apparent that the apprenticeship system needed to be replaced with a more formal education for naval architects and marine engineers. Webb created a school to fill that need, and by 1897 the first class of eight had graduated from Webb’s Academy and Home for Shipbuilders, known today as Webb Institute. The original Bronx-based campus also provided a free home to old shipbuilders, including a number of Webb’s former employees. By 1899 the Academy was providing housing to about 400 students and retirees and Webb underwrote all the operating expenses of the school until his death (in 1899). His endowment, combined with subsequent gifts, has allowed the school to remain the only full-tuition scholarship program of its kind in the country. “Webb had a reputation for integrity and a strong sense of civic duty,” said Keith Michel, President of Webb Institute in accepting the NSHOF honor. Well-known Brazilian-American sailor Vince Brun (1947-) was born in New York where his family lived for eight years before returning to their South American homeland when Brun was three years old. His parents were cruising sailors and Brun’s first sailboat was a converted rowing dinghy borrowed from the deck of their boat that was fitted with a mast built by his engineer father and a sail sewn by his mother. His sailing resume is replete with numerous world and national titles in a variety of classes – both as skipper and as crew –. including 1981 and 1983 Soling World Champion, 1986 Star World Champion, 1998 Melges 24 World Champion, crewing for Dennis Conner in his 1992 and 2003 America’s Cup campaigns, and 2000 Etchells World Champion. Brun, who was president for 30 years of North Sails One-Design, resides in San Diego with his wife Marsha. The parents of two daughters, they are also new grandparents. Posthumous Inductee George Coumantaros (1922-2016), a recipient of the Lifetime Achievement Award, spent his early life in Greece, until the outbreak of war in 1940 forced the family to relocate to Argentina. Upon moving to the US in 1947, Coumantaros founded the Southern Star Shipping Company which transported industrial steel, aluminum, coal, cement and petroleum internationally. In 1960, he established a flour mill in Nigeria, ultimately expanding into other food products and employing 12,000 people; his dedication to the economic and social advancement of the Nigerian community earned him great respect. In the 1950s Coumantaros became an avid offshore sailor and promoter of the sport. Closely involved in the design of his yachts, he had a series of boats named Boomerang on which hundreds of young sailors gained experience that allowed them to compete in notable events such as the America’s Cup. Coumantaros competed in the famous Fastnet Race of 1979, and in the Newport Bermuda Race a notable 26 times in 52 years. After crossing the Bermuda finish line first a remarkable five times, he achieved a life-long goal when he won overall honors in 1996. Coumantaros donated his last Boomerang to the US Merchant Marine Academy (Kings Point, N.Y.) for use by midshipmen as a training vessel. Inductee Bill Koch (1940-) is also a recipient of the NSHOF Lifetime Achievement Award. The Kansas born Koch, founder of a multinational coke and Sulphur products company, was an atypical entrant competing for the 1992 America’s Cup, having only taken up sailing in the mid-1980s. However, Koch, who earned undergrad, graduate and doctoral degrees in chemical engineering from the Massachusetts Institute of Technology, assembled a team to study the science behind boat design and the resulting research delivered a fast boat. Koch’s approach to selecting the crew that would race America3, which he would drive, was not to focus just on sailing skills but also the ability to work as a team. After winning the Defender Series, Koch defeated Italian challenger Il Moro di Venezia to win the 1992 America’s Cup. In 1951, crewing for the legendary Bahamian sailor Durward Knowles, Schoonmaker won his first Bacardi Cup in Havana. Schoonmaker would go on to win the high-profile Star class event, as a skipper, an additional seven times (1953, 1964, 1970, 1971, 1974, 1976 and 1977). Schoonmaker’s involvement in Olympic sailing started in 1952 when a second-place finish in the Star U.S. Olympic Yachting Trials earned him the position of reserve helmsman at the 1952 Olympic Games in Helsinki; he would repeat that role at the 1964 Olympics in Tokyo. The highlight of his sailing career came in 1975 in Chicago where he won the Star World Championship in a fleet of 73 boats. He is a 12-time Star Continental Champion and the 1971 Rolex Yachtsman of the Year. Sailors from all corners of the country nominated their choice for induction, after which the selection committee reviewed a wide range of nominations to determine the members of this class of Inductees. Nominations are accepted year-round at nominate.nshof.org, with March 30 as the cutoff for nominating someone for the current year. Inductees are American citizens, 45 years of age or older, who have made significant impact on the growth and development of the sport in the U.S. in the categories of Sailing, Technical/Design and Contributor (coach, administrator, sailing media). Nominations of non-citizens were also considered if they influenced the sport in the U.S., and posthumous nominations were also accepted. The undertaking to recognize Americans who have made outstanding contributions to the sport of sailing is central to the mission of the NSHOF which was formed in 2005. The invitation only event was sponsored by VCFA Group/Dayton Carr. Additional support was provided by Rolex Watch U.S.A., Bull & Bear, CBIZ Property & Casualty, Heineken Light, Ralph and Martha Marrinson, Andy Rose, Mount Gay Rum, Pier Sixty Six, Silent Maid and WX Wines. The NSHOF dedicated the 2018 Induction to the Lauderdale Yacht Club Sailing Foundation which is dedicated to educating future sailors, primarily between the ages of eight and 18.